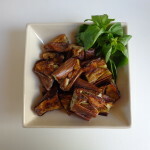 This recipe may be prepared ahead of time and the eggplant served warm or at room temperature. It is so tender that it may be eaten with a spoon. If you’d like to serve it as part of a Mediterranean mezze spread, other dishes that marry well are spicy Moroccan carrot salad, chick pea salad with cumin and dill, herbal tomato salad and tapenade. Here’s a key to success: Use a roasting pan just large enough to hold the eggplant halves, which will retain their shape if they are touching each other when they go into the oven. Preheat the oven to gas mark 6 (200 C, 400 F). Rinse the eggplant, remove the stem and slice in half lengthwise. Score the flesh in a diamond pattern, being careful not to cut through the skin. Peel the garlic clove, slice in half lengthwise and cut into slivers. Insert the slivers into the incisions in the eggplant halves. Using a pastry brush, coat the bottom and sides of your roasting pan with 1 tsp. olive oil. Place the eggplant halves in the pan. Drizzle the remaining 4 tsp. olive oil over the eggplant pieces. Sprinkle on the cumin, salt and pepper. Crumble the cayenne pepper in a paper towel to protect your hands, and sprinkle it over the eggplant. Place the roasting pan in the oven and cook until the eggplant is very tender, about 40 minutes. Check occasionally. If the eggplant seems to be cooking too fast — if the flesh starts to turn brown — turn down the heat a bit. 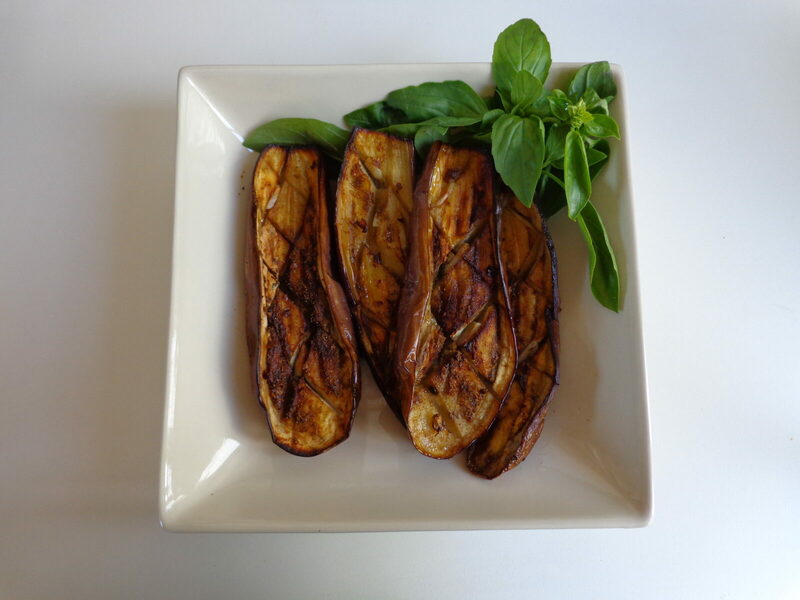 While the eggplant is roasting, squeeze the lemon juice half into a small bowl through a sieve to remove the seeds. Chop the fresh herbs. When the eggplant is done, remove from the oven. Just before serving, drizzle with the lemon juice and top with the chopped herbs. Serves 2. 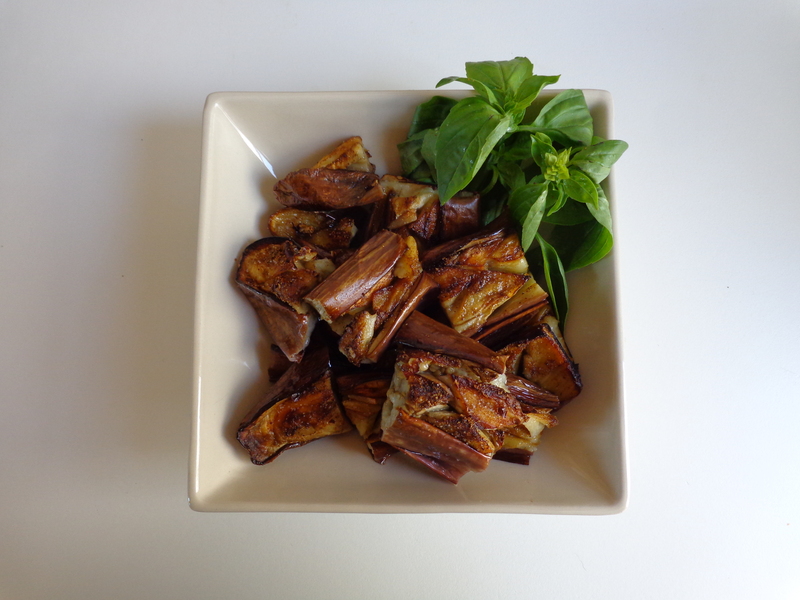 Tip: To present the eggplant as part of a mezze spread, slice the roasted halves into smaller pieces as shown in the photo.